Sometimes… just sometimes, even though the opportunity arises for only a split second, someone catches the perfect shot at the perfect moment. The result is often breathtaking, mind-boggling, or just plain hilarious… especially where animals are involved. Here we have 10 perfectly timed photos of animals that will do just that – take your breath away, make you look twice or just make you LOL! This photo makes you wonder what the dog was thinking. 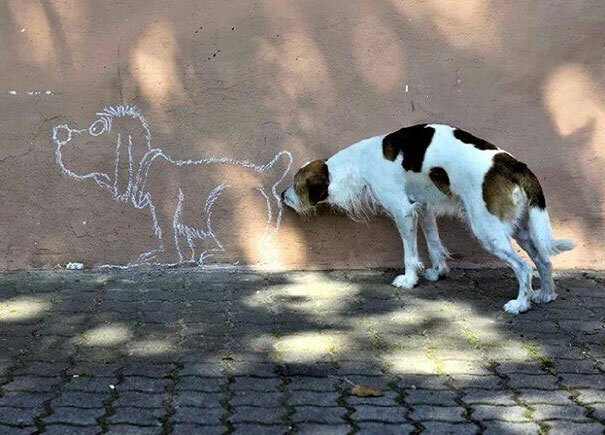 Did it really see the chalk drawing of the dog on the wall as a fellow canine, or did the camera person cunningly set it up by smearing some scent near the derrière of the dog drawing. Either way, the timing of the shot is impeccable.